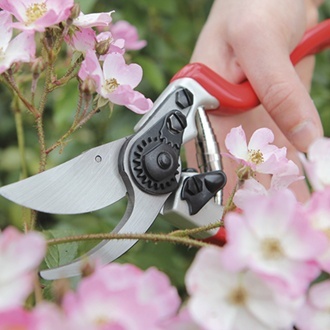 Darlac Expert Bypass Secateurs/Pruner-ideal even for small hands. Drop forged with extra deep sap groove and SK5 carbon steel blade, a wire cutting notch and shock absorbing buffers. Cut Capacity: 25mm. This top of the range ergonomically designed pruner has slim profile handles, offering greater comfort even for small hands. Drop forged for strength and durability. Extra deep sap groove and SK5 carbon steel blade for a razor sharp edge. Incorporates a wire cutting notch and shock absorbing buffers. Weight: 254g, Overall Length: 215mm, Cut Capacity: 25mm.